….Justin Timsit of The Rittenhouse Philadelphia! Justin will join the AWMB at the Vie Vinum festival in Vienna this year, gratis! Second place: Robin Pohlman of Cafe Katja who received a scholarship for the wine education program of her choosing. Third place: Chris Raftery of Corkbuzz Wine Studio who received an Aldo Sohm Wine Key valued at $150. The competition was fierce and we were elated by the high scores of many of the 27 competing sommeliers on both the theory and the blind tasting, but the final three contestants were also required to compete in a service exam. 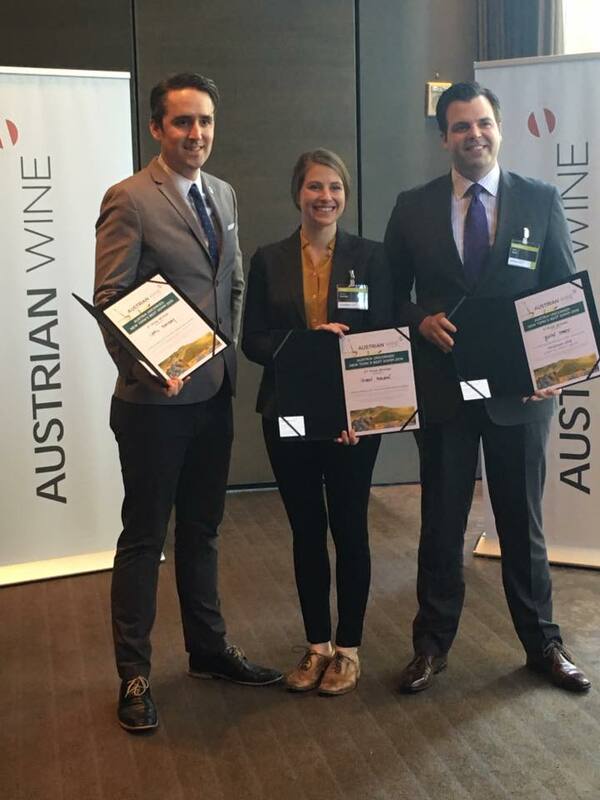 Although it’s evident that all three are worthy of their positions on the floor, it was Justin who prevailed in a combination of knowledge about Austrian wine, in general, and also his skills on the floor. One thing is for sure, this is the first of many competitions we will host. Stay tuned for new markets!